Clarke & Severn Electronics announces the introduction of a new range of sealed HDMI connectors from Conxall. Conxall’s sealed HDMI Connector Series is the latest in the Data-Con-X family of products, sealed to IP67 and IP68 NEMA 250 (6P) when the panel connector is rear mounted and mated to the cable, and RoHS compliant with UV f1 rated housings. The Data-Con-X HDMI series is easy to assemble with a quick connect bayonet or threaded style interface. Feed-through termination on the panel allows for easy field installation. 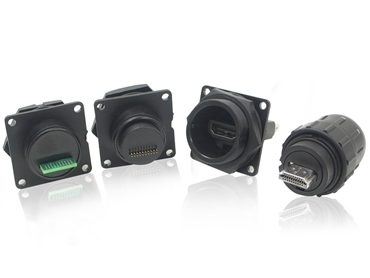 Panel mount connectors are available in feed-through, PC through holes or 20 pin header styles. Cable ends are available in quick connector or threaded coupling nuts and can be optionally overmoulded to the cable to improve pullout strength and sealing.